The QWF, in collaboration with CBC Montreal, and McGill University’s Institute for the Public Life of Arts and Ideas and the Social Equity & Diversity Education Office, is proud to present a public celebration of stories written by and about Indigenous Canadians. Now in its second year, the event will take place on Sept. 20 at 7 p.m. in Tanna Schulich Hall, located within McGill University’s Elizabeth Wirth Music Building. Admission is free. The event will be broadcast on cbc.ca/montreal and Facebook Live. Shannon Webb-Campbell, Montreal-based Mi’kmaq poet, writer, and critic will discuss Bearksin Diary by Carol Daniels (Harbour Publishing Co.). 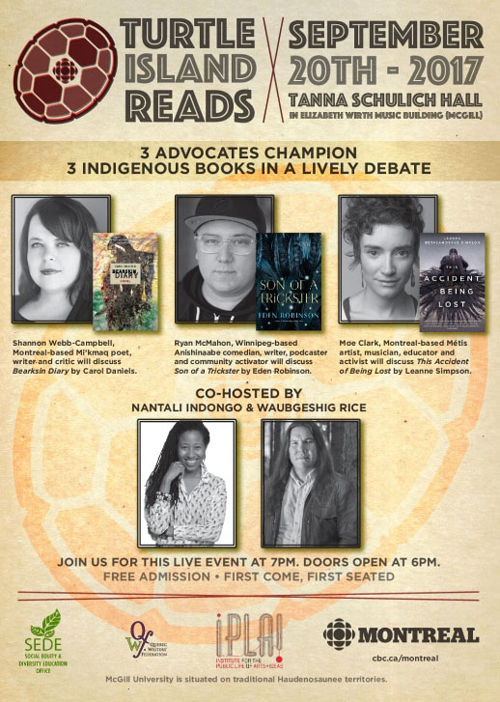 Ryan McMahon, Winnipeg-based Anishinaabe comedian, writer, podcaster and community activator will discuss Son of a Trickster by Eden Robinson (Knopf Canada). Moe Clark, Montreal-based Métis artist, musician, educator and activist will discuss This Accident of Being Lost by Leanne Simpson (University of Toronto Press). The Quebec Writers’ Federation is offering a one-day writing workshop: “Indigenous Poetics,” led by Shannon Webb-Campbell, on Saturday, October 14, 2017. Poets of all levels, Indigenous and non-Indigenous, are welcome. Workshop registration will open to members of the public at the end of August. Contact workshops@qwf.org for information.